Hahnel is set to launch a two new wireless flash triggers, with one being ruggedised for outdoor use and the second being more sophisticated and intended for controlling multiple flashguns indoors. As usual, both triggers come in two parts with a sender that sits in the hotshoe on top of the camera and a receiver that has a hotshoe to accept the flashgun. The Tuff TTL is constructed from durable plastic and is supplied with a rubberised casing for extra protection. 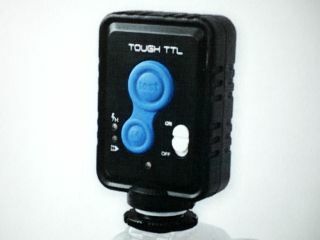 Although not fully waterproof, the Tuff TTL is water resistent had has tough, rubberised buttons. While the sender has a power switch and two buttons, the receiver has just one test button. While the Tuff TTL can only work with one receiver and flashgun, the more sophisticated Viper flash trigger can be used with a near limitless number of flashguns and receivers. The flashguns can be controlled in three groups and, uniquely, the output of each group can be controlled separately using a dial on the side of the transmitter. Both systems use ISM 2.4 Ghz wireless transmission control to ensure dependable triggering of flashguns over a range that is claimed to extend to over 200m. As soon as the units are turned on they begin Digital Channel Matching to find a secure channel for communication. Power is supplied by two AA batteries in each sender and receiver. According to Chris Hahnel, the units could be made smaller if a different power supply was used, but as photographers use AA cells in flashguns these are a more convenient choice. The Tuff will be available for use with Canon EX II flashguns in early April, with Nikon compatible units following later. Software issues with Nikon's flash system mean that the Viper will only be available for Canon EX II flashguns, it is set to go on sale in the summer. Prices have yet to be finalised, but the Tuff is expected to retail for around £99 while the Viper will be £200.